This page provides links to useful Dante websites, as well as to recent media stories on Dante. The Dartmouth Dante Project The Dartmouth Dante Project is a searchable full-text database containing more than seventy commentaries on Dante's Divine Comedy - the Commedia. 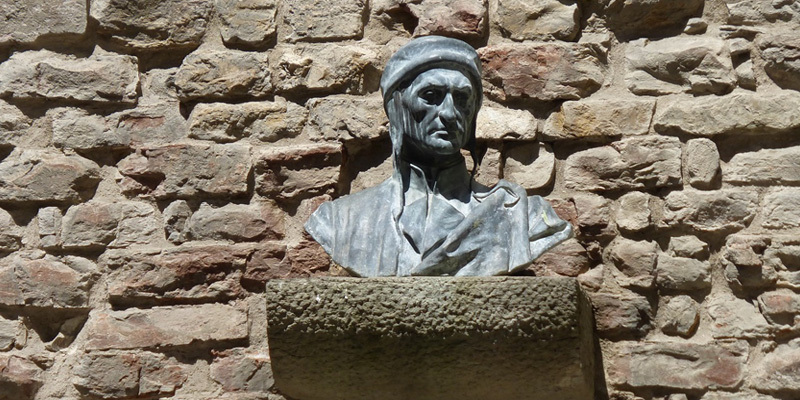 The Princeton Dante Project The Princeton Dante Project includes multimedia readings of the Commedia in Italian and English, the texts of lectures on Dante, images, and the texts of Dante's works. Dante Online This website, run by the Società Dantesca Italiana, includes the texts and translations of Dante's works, bibliographical information, and recordings of music associated with Dante's works. The William and Katherine Devers Program in Dante Studies The Devers Program in Dante Studies is based in the University of Notre Dame; the website provides details of its activities, including its publications and library resources. Dante Worlds Run from the University of Texas at Austin, this website combines artistic images, textual commentary, and audio recordings. The Dennis and Phillip Ratner Museum This rich website contains images of work by Phillip Ratner in the Ratner Museum in Bethesda, Maryland, including a very interesting set of sculptures forming the pieces of a Dante chess set, representing figures from the Commedia. (The Museum's main page contains a link to the Dante works.) An excellent example of how Dante's work continues to provide powerful inspiration for the visual arts today. The Daily Telegraph reports that Johnny Depp has bought the film rights to a novel about Dante's Commedia. The Guardian on the place of Limbo in the Catholic Church (1st December 2005) Jonathan Jones discusses the place of Limbo in modern Catholicism.